Last month, I decided to treat myself to a couple of items on ASOS, and last week, I returned them. I usually have pretty good luck with my ASOS orders (since some of my favorite items in my wardrobe are from ASOS), but unfortunately, this order was kind of a bust. 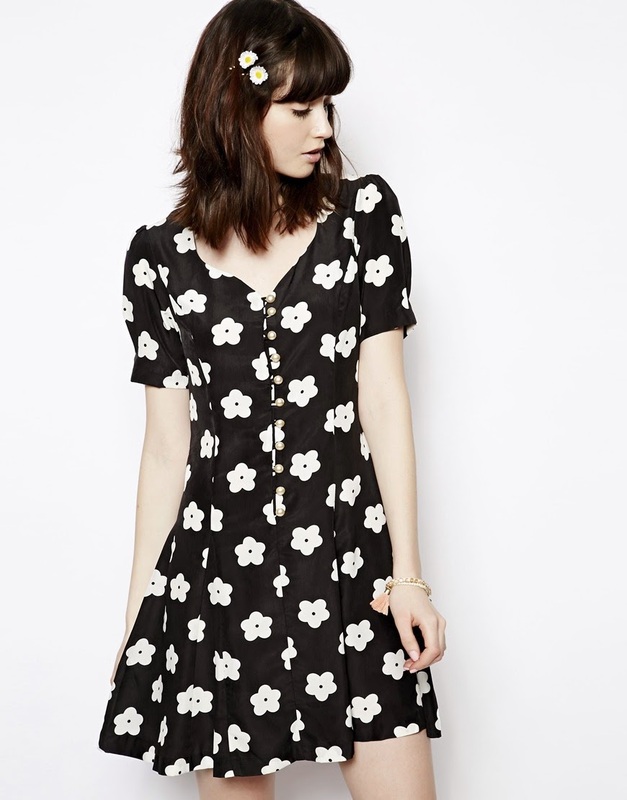 I purchased the Daisy Mono Print Sweetheart Dress (by Nishe) and the Mini Body-Conscious Skirt With All Over Bat Print (by Your Eyes Lie), which were both on sale and available in my sizes (I got the dress in a size 8 and the skirt in a medium). Since my subtotal was a little over $50, standard shipping was free and relatively prompt per usual - I placed my order on January 31st, and I received my order on February 7th. Since I was in New York when my order arrived, I didn't get to open and try on my new clothes until later that week. I was really excited to incorporate these new items into my wardrobe, but alas, it just wasn't meant to be this time. The daisy dress was cute in person, but the material was totally different from what I was expecting - although the print and button-detailing were beautiful, but the polyester woven fabric was much thinner and sheerer than it looked online. The fit was also a bit awkward; the sleeves clung uncomfortably on my upper arms and the dress just looked frumpy on me. I think the dress could've had some potential if I ordered a larger size for a looser, smock-like silhouette, but I was really hoping for a more flattering fit-and-flare silhouette. 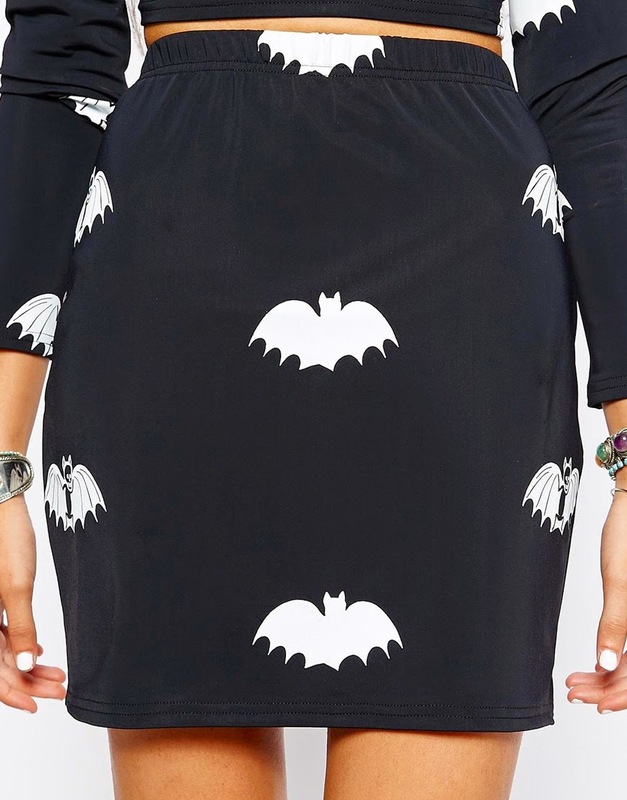 I also ordered this bat-printed bodycon mini skirt, which I had been eying for a couple of months before it went on sale. Although the skirt did fit, the material was also kind of weird; the cotton-poly blend felt like athletic nylon material, and the screenprinted bats seemed like they were prone to cracking and wearing off of the fabric. This skirt just looked and felt cheaper in quality than my printed bodycon skirts from Forever 21. Despite this fluke of a purchase, I was able to send back my order (for free and with tracking) and get a full refund without any hassle. I still enjoy shopping on ASOS, but I'm really grateful for their easy breezy return policy. Where is the bat-ring from? It's a vintage ring I found on eBay.